Ruth Levine enjoys baking in part because every time one bakes, it’s “kind of a surprise” how the finished product will turn out, especially when slicing into something with filling. 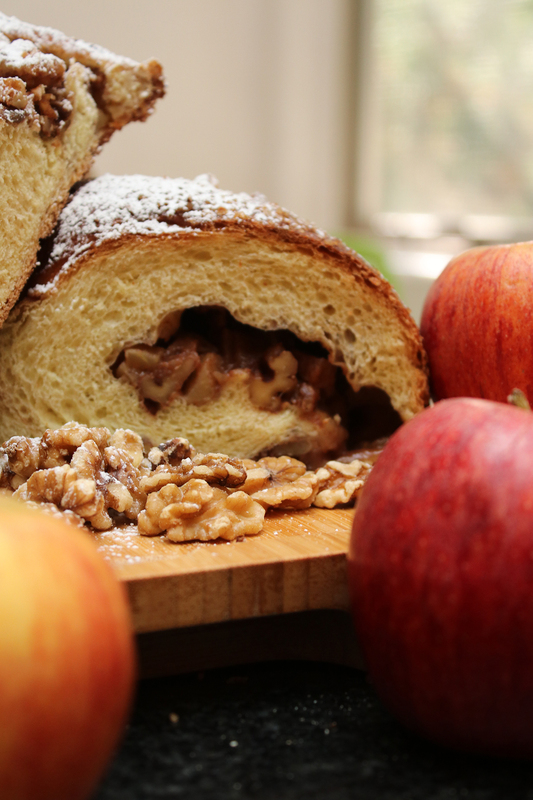 Here, the inside of her apples-and-honey challah turned out just right. 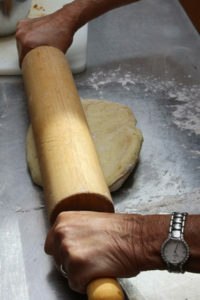 Levine uses her mother’s rolling pin to work the dough. Challah has regularly been on the table during indelible moments in Ruth Levine’s life, from after-school snacks she enjoyed Friday afternoons as her mother prepared Shabbat dinner to the “beautiful” challah the Lax family – of the former Lax & Mandel bakery in South Euclid – baked for her following the birth of her son. As traditional as challah is to Levine and the Jewish community at-large, it mustn’t necessarily be prepared in a traditional manner. “One of my best dishes – I love serving this at a brunch party – involves pulling apart the challah,” she says. “You soak the pieces in that French toast mixture, and I’ll use some orange liqueur, cream, vanilla – this is not a diet dish – and then I’ll have a wok going with oil and I deep fry them so they come out like doughnuts. They’re like challah doughnuts. 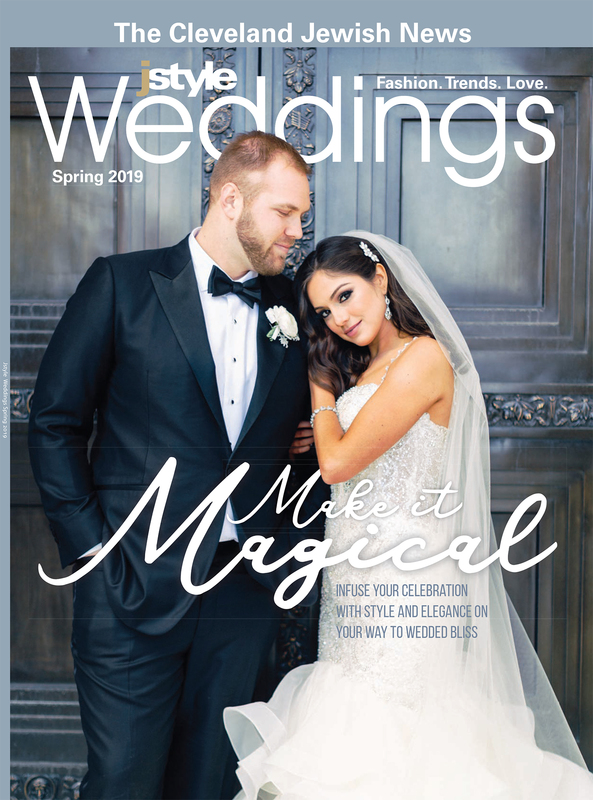 Since selling Bistro 185, Levine has been encouraging her brand of culinary creativity as an instructor at the Loretta Paganini School of Cooking in Chester Township, where she’s written her own curricula for classes on Spanish tapas, Vietnamese cuisine and the foods of India. She also occasionally instructs students on Jewish dishes. “I did do a quasi-kosher-style Jewish kind of cooking class based on some of the work of Ina Garten (of Barefoot Contessa fame). I did some of her traditional Friday night dishes, and that was a big hit. I gave (them) a French twist,” she says, adding she may offer another Jewish-themed class leading up to Passover. 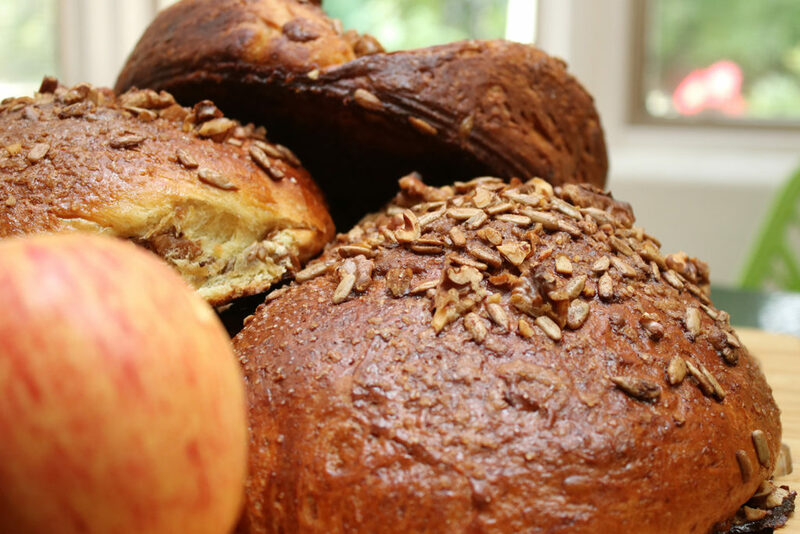 To spark similar creativity among Jstyle readers, Levine offers her recipe for apples-and-honey challah, a dish that incorporates two elements that, to her, are key to a good challah. Levine likes adding sunflower seeds to give this challah a sweet-and-salty element. This particular challah is round, which carries significance – along with apples and honey – in the fall, around the High Holy Days. It’s also practical considering the way in which the apple filling has to be folded in. In general, though, Levine tends to prefer round challah over braided. Levine adds powdered sugar to her challah for taste as well as decoration. Levine folds her apple filling into the dough. Turbinado sugar, cinnamon, chopped walnuts and salted sunflower seeds for taste contrast. 1) Make your dough: Whisk yeast and 1 teaspoon honey into 2/3 cup warm water and let stand until foamy, a few minutes. With a stand mixer: In the bowl of a stand mixture, whisk together yeast mixture, oil, remaining honey (1/3 cup), eggs and yolk. Switch to dough hook and add 4 1/4 cups flour and salt. Use dough hook on a moderate speed until it pulls all of the flour and wet ingredients together into a craggy mass. Lower the speed and let the dough hook knead the dough for five minutes, until smooth, elastic and a little sticky. By hand: In a large bowl, whisk together yeast mixture, oil, remaining honey (1/3 cup), eggs and yolk. Add flour all at once and stir with a wooden spoon until you get a craggy mass of uneven dough. Turn dough out onto a floured counter and knead it into a smooth, elastic dough, about five to eight minutes. Try to use as little flour as necessary when kneading the dough; you don’t want to toughen the bread. A bench scraper can make it really easy to remove it from the counter if it gets stuck in a spot. 2) Both methods: Transfer dough to large oil-coated bowl, cover with plastic wrap and set aside for one hour, or until almost doubled in size. 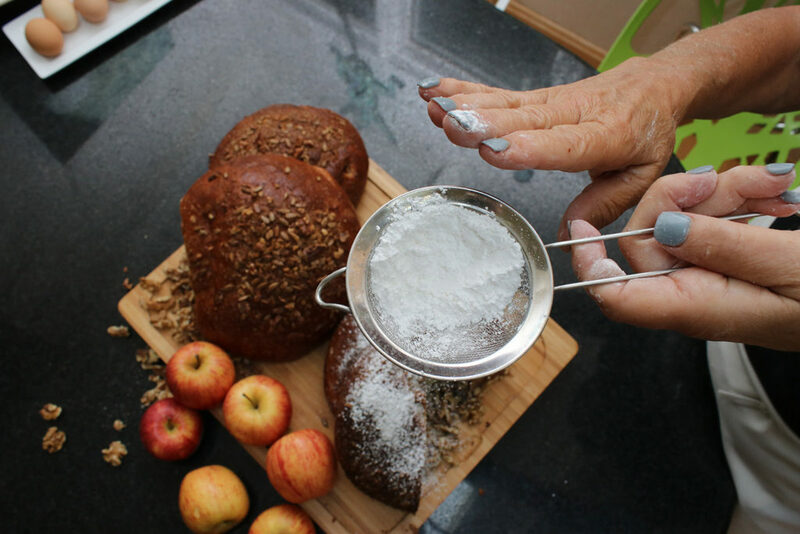 3) Add apples to dough: Turn dough out onto a floured counter and gently press it down into a flat, oblong shape. The shape does not matter so however it goes, it goes. Spread two-thirds of apple chunk mixture over half of the flattened dough. Fold the other half over the apple chunks and press the dough down around them, flattening the now lumpy dough. Spread the remaining one-third apple chunk mixture over half the folded dough. Fold the other half over the apples, pressing the dough down again. Your dough packet will likely be square-ish. Fold the corners under with the sides of your hands and form the dough into a round. Upend your empty bowl over and set it aside for another 30 minutes. Divide dough into four pieces. Roll and stretch each one as carefully as you can into a rope – don’t worry about getting it too long or thin, just 12 inches or so should do. If any apple chunks fall out as you form the ropes or at any other time in the forming of the loaf or risings, just poke them back in with your finger. Transfer the dough to a parchment-covered heavy baking sheet or baker’s peel (if you’ll be using a bread stone). Beat egg until smooth and brush over challah. Let challah rise for another hour but 45 minutes into this rise, preheat your oven to 375 degrees. 4) Bake your loaf: Before baking, brush loaf one more time with egg wash and sprinkle with sugar walnut topping. Bake in middle of oven for 40 to 45 minutes. It should be beautifully bronzed; if it starts getting too dark too quickly, cover it with foil for the remainder of the baking time. The very best way to check whether it’s done – in any bread, but especially one like this where the wetness of the apples can slow down the baking time a bit – is with an instant-read thermometer. The center of the loaf should be 195 degrees. Cool loaf on a rack before serving.